We all want to write songs that are original, interesting and unusual, and that’s not easy with such a popular instrument. Looking for a new and inspiring chord? Every combination of four fingers and six strings across four frets (or five if you’re feeling athletic) has already been tried. Need a new chord sequence? Every variation of the basic open major and minor chords already appears in a song somewhere. If we start creating a new song just by strumming some chords, the chances are that our chord pattern will be a ‘classic’, or, to use a more unkind word, a cliché. Of course, that’s not always a bad thing, as shown by the dozens of famous hits that use the well-loved C-G-Am-F loop, but if we’re looking for originality, it’s unlikely to be found in the first chord pattern that falls under the fingers. When we’re trying out chord ideas, we’re more likely to play 2 or 4 bars than a longer chord sequence – say, 8, 16 or 32 bars. 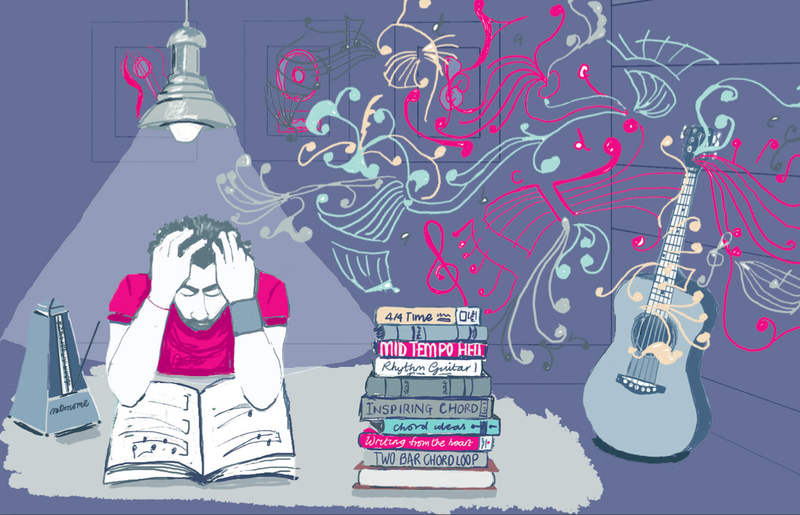 This is perhaps because our brains prefer to focus on short passages of music that are easy to remember while we concentrate on melody or lyric. The more you strum the loop, the more familiar and comforting it becomes. Before you know it, the loop becomes the song and you’re asking an audience to listen to the same chords over and over for three and a half minutes. Dull! And rhythm guitar has another important effect – it makes us sing after the downbeat. Something about the psychological ‘crutch’ provided by a guitar backing often makes the songwriter breathe at the start of the bar and start singing on the second or third beat. This can result in melodies that are difficult to remember and have less impact for the audience. Playing rhythm guitar, particularly on an acoustic, is a physical act, involving the picking hand moving from the wrist/elbow evenly in time with the music. And this is physically more comfortable at some tempi than it is at others. If you’re strumming straight 8 up-and-downstrokes in 4/4 time, anything below about 90 beats per minute (BPM) feels like it’s dragging, and anything above 120 can seem like hard work. So you settle for something between the two extremes where your rhythm part feels comfortable and natural. I call this place mid-tempo hell. So is there an alternative, or are we all doomed to be strumming E minor mid-tempo chord loops forever? The most useful thing we can do as songwriters is to be aware of these traits in ourselves and in others, and try to challenge them in our playing and in our composing. If we know what the habits are, we can control when and how we break them. Stuck in mid-tempo hell? Try setting a metronome to 140BPM before you start. Bored with your two-bar chord loop? Write out an 8-bar chord sequence on a piece of paper and jam around it for a while, making edits as you go. Bored with that Cadd9 shape? Try an altered tuning, or a capo. Singing on the 2nd beat of the bar throughout your song? Force yourself to start phrases on the downbeat in the chorus, and on the upbeat (before the barline) in the verse. And if all else fails, try a lyric-first or melody-first approach; you don’t have to start your new song by strumming chords. Process and product are closely related in songwriting, and if you’re in control of the former, the latter won’t be far behind. And don’t worry – the guitar is your friend. But all good friendships need a little space sometimes.